Today I took on a children’s snack giant: the tiny goldfish cracker. It was our family’s turn to bring “special snack” to my daughter’s school. But in my mind, “snack” equalled “educational opportunity”. An opportunity to tie the day’s food into the weeklong theme on farming that her class was doing. An opportunity to expose children to some unlikely contenders for snack – namely, vegetables. And an opportunity to talk with them about where food comes from. When I signed up for special snack weeks ago, my mind started racing with ideas – I was genuinely excited to figure out the puzzle of how to get the kids excited and learning about healthy food. Did this snack take five minutes to make the day-of? No. Did I go to a store and grab something off the shelf? Nope. As my friend at Grow Your Family Strong knows, good eating takes good planning. I shopped at the farmers market and grocery store in the days prior. I cut up veggies the night before and mixed the yogurt. And I plated everything the day of. All told, excluding shopping, it took me an hour to make snack for 16 children. But if I were to feed this snack to my kid on a typical day, I’d cut veggies one day and have them ready for the week, and maybe mix the yogurt as I needed it. Either way, it would take me mere minutes at go-time once I’d planned it out. I knew I couldn’t just plunk down this creative crudité in front of three-year-olds and expect them to devour it. I had to set the scene. First I read the book, The Surprise Garden, and asked the children to name fruits and vegetables in the book, and those they have seen in real gardens or farms. I then showed real samples of whole vegetables that the children would then find cut up in their snacks just minutes later. Note the foreshadowing. I could write mystery novels. Next, I brought out the tray of veggie cups. I wanted to build drama and excitement for the kids. It worked! I was nearly trampled by 16 three-year-olds clamoring to get a look at fresh veggies. I again held up the real whole vegetables and showed them what each looked like cut up in the cups they were about to receive. Then they sat down, and I served the cups. Next, I brought out the whole wheat boule of bread. Again, dramatic – a giant boule of bread is a different story than a cut up slice of bread from a pre-packaged bag. With teachers’ help to spread fresh butter from grass-fed cows, the kids nearly all gobbled up the bread. And finally, the pièce de résistance, the Cookie Monster berry dish. My friend shared this idea with me via The Produce Mom. Since most kids like fresh berries, and most welcomed the opportunity to “eat a monster”, the fruit was gone in a flash with many kids having third and fourth helpings. The snack introduced children to veggies they may not have seen or previously tried, or reinforced their familiarity with them, with many kids eating most of the veggies. Some children took “thank you bites” to at least try the food, but even if they didn’t try, they were exposed to them so maybe at a future offering, kids won’t be turned off. The snack gave us an opportunity to talk about their own experience with and relationship to food, and teach them more about where it comes from – and ultimately, that food comes from real, living plants. No tricks, no pleading, no fancy cooking. 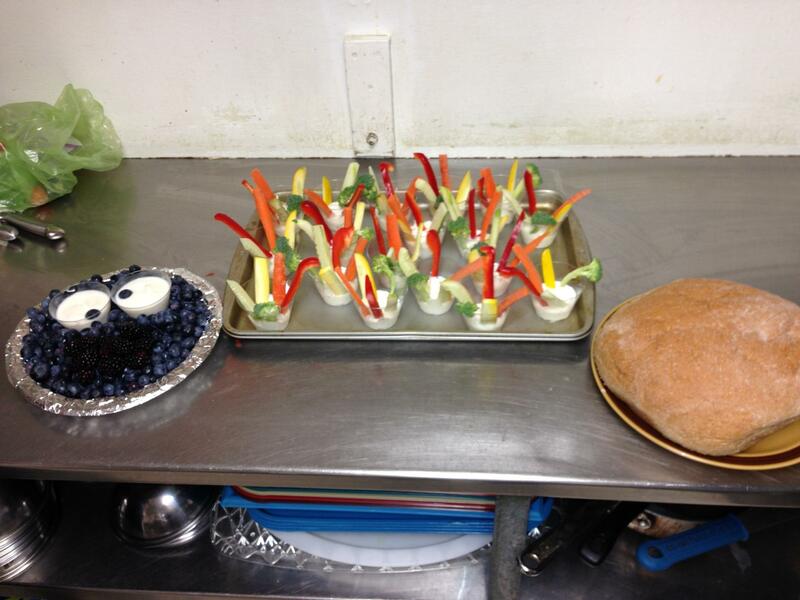 Just simple fresh food served in an inviting way. Kids are no dummies. It looked good, so they ate it. 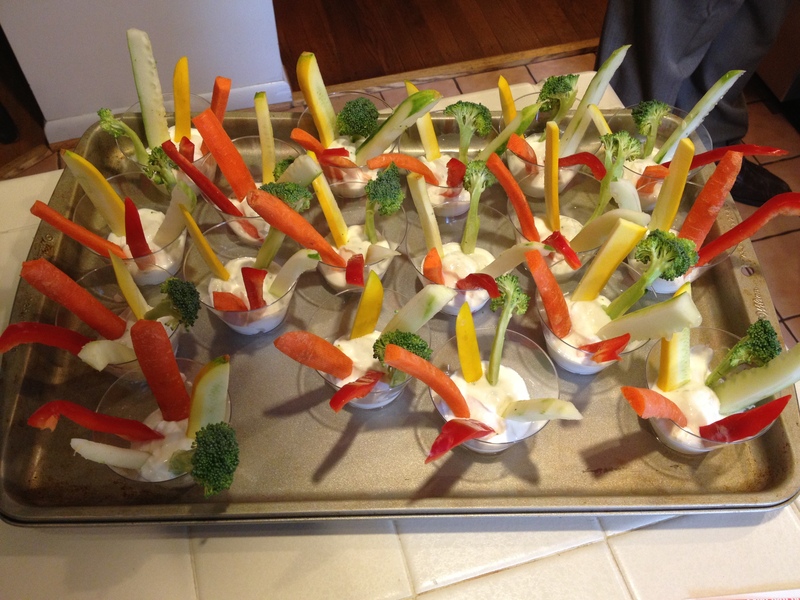 Veggie cups with yogurt-ranch dressing: Pick a variety of colors from your farmers market or grocery store (get local and organic if you can for the best flavor). Slice them up. Get a good quality yogurt (I used low-fat Greek yogurt for a protein-punch) and stir in some olive oil, a touch of sugar and spices like dried garlic, onion and salt (I used the Penzey’s brand Fox Point blend). Put a dollop of yogurt in each cup, stand the veggies in and done! A fresh whole wheat boule: I picked up a loaf at Great Harvest bread since I didn’t have time to make one fresh. 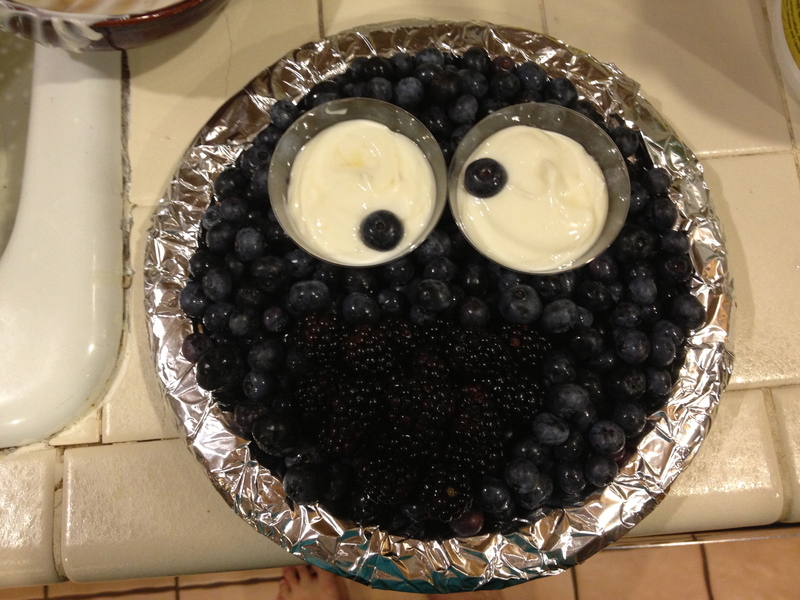 Berries à la Cookie Monster: All you need is fresh blueberries and blackberries, and yogurt. I used Greek yogurt and added local honey. See The Produce Mom link above for more Sesame Street food ideas. Great post & this is how we teach kids to love food that loves them back!